Nowadays, over 100 million Americans are very reluctant when it comes to taking a trip to the dentist so as to have their teeth examined and this is mostly out of fear of pain. However, some dentists now incorporate Sedation Dentistry in their practice so as to eliminate such fears. Sedation Dentistry is a simple procedure that makes use of a combination of techniques that range from general anesthesia to nitrous oxide in order to keep a patient calm and relaxed during surgery or uncomfortable dental care. Finding a Houston, Texas sedation dentist can be quite challenging. However, New Smiles one of the few dental care facilities that have qualified and professional Houston sedation dentists. New Smiles is an independently owned and operated dentist organization in Houston which offers state of the art and cutting edge dentistry technology. The company has 3 convenient offices located in the Houston area that have several experts who provide their patients' dental care needs. It is also one of the few companies that offer sedation dentistry in Houston, Texas. Depending on your level of stress or anxiety, New Smiles sedation dentistry Houston offices offer various levels of sedation for patients. You can choose to be heavily sedated or be sedated just enough to keep you calm and unaware of the treatment. The sedation dentists at New Smiles will ensure that you receive an optimal level of sedation that will leave you feeling completely refreshed and unaware of what happened during the procedure. Types of Sedation Dentistry Offered by New Smiles. 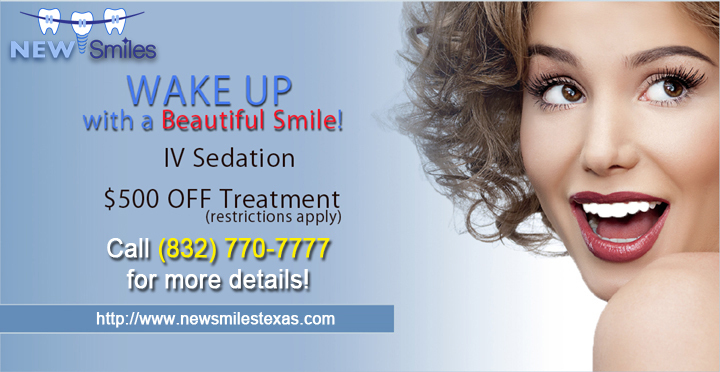 New Smiles offers 4 types of sedation dentistry in Houston. These are 1. Nitrous Oxide / Laughing Gas Sedation. The Nitrous Oxide sedation is one of the most common forms of sedation use in most dental offices. It is also used to relieve pain when giving birth and is well suited for patients who have mild fear and require minor dental procedures. Nitrous Oxide does not put you to sleep and is very effective when it comes to reducing a patient's anxiety about a dental procedure. It is completely safe and available in various sleep dentistry offices in Houston. It can also be used in combination with local injection of anesthesia for consistent effectiveness and some are almost painless. The gas can also be administered via a machine so as to further eliminate the discomfort of injection. IV sedation is best suited for patients who have strong fears, require a major dental procedure, and those who are medically compromised. It is a common method of sedation whereby the sedative is directly injected into the vein. IV sedation dentistry in Houston allows the dentist to provide a deeper sedation while ensuring that you remain awake during the procedure but less aware of what is happening. The process will require you to recover momentarily after leaving the office. This type of sedation comes in the form of liquid or a pill that you take orally. It is suited for patients who have strong fears and require a major dental procedure. It is taken similarly to local anesthetics and most of the times used in combination with Nitrous Oxide. It may leave you awake but completely relaxed and calm about the dental procedure. General Anesthesia is a type of sedation which ensures that you sleep during the entire procedure. It makes use of drugs which are directly injected into a vein along with the option of inhaling a gaseous anesthetic. After the procedure, a complete recovery time in the office may be necessary before leaving. Is Sedation Dentistry a Good Option for Dental Procedures? - Don't like shots and needles. - Greatly fear paying the dentist a visit. - Have previously endured traumatizing dental experiences. - Have sensitive teeth. - Have been compromised medically. - Dislike the tastes, noises, and smells that are associated with dental procedures. - Are not confident about their teeth. - Have a bad gag reflex. - Helps to manage complex dental procedures easily. - No pain is felt. - Helps the Patient to remain completely calm and relaxed. - Allows various dental procedures to be completed in a short time - No gagging. Is Sedation Dentistry Services in Houston Safe? The methods and drugs used by all the New Smile offices in Houston Texas have a proven record of safety. Prior to every dental procedure, we take each patient's health history, blood pressure, respiration, and pulse so as to ensure no unexpected complications occur before, during, or after the procedure. In cases whereby enteral or IV sedation is to be used for the procedure, we use detailed monitors so as to keep track of blood pressure, blood oxygen levels, and pulse. All our Houston sedation dentists have extensive training and experience in implementing the different dental sedation procedure types and our emergency life support techniques are in accordance with the Texas State Board of Dental Examiners. We also ensure that all IV sedation is administered by a dental anesthesiologist doctor with advanced training in anesthesia and emergency. There is no doubt that sedation is the best option for a lot of people who are hesitant when it comes to visiting the dentist. Some dentists also opt to use it for themselves when they undergo certain procedures. However, sedation is not for everyone and should not be forced on people who prefer not be sedated. Sedation Dentistry is also not available everywhere and people who live in Houston, Texas should consider themselves very lucky to have this option readily available right in their neighborhood. its usage and applications are completely safe and medically approved but may not be used on patients who have various types of medical issues that may lead to more complications. Make an appointment today with New Smiles implant and Orthodontic Center to find out more. How to Make a Sedation Dentistry Appointment at a New Smiles Dental Office in Houston. New Smiles loves to serve the Houston community and has therefore established multiple offices in the greater Houston area. Our dental offices can provide you with every type of dental procedures that range from dental implants to dental cleanings. Our main goal is to ensure that each one of our dental patients gets an incredible experience that will keep them coming back to our offices as well as provide them with a healthy and beautiful smile. In order to make an appointment for further consultation, you can visit our current address at 11415 Bellaire Blvd Suite C in Houston, Texas 77072, or get in touch with one of our customer care representatives by calling them at (832) 770-7777.